CLEARWATER, FL- For most Phillies minor leaguers, the season ended weeks ago. For a few dozen of them, this month is set aside for additional training and work. One of those players is 22-year-old lefty pitching prospect Nick Hernandez, who was sidelined for much of this season with a shoulder injury. As a result, Hernandez, a South Atlantic League All-star with the Lakewood BlueClaws this year, is putting in extra time in Clearwater Florida, to increase his 2010 innings total. After Wednesday's instructional league exhibition game, Hernandez and ten teammates, including Jarred Cosart, Jacob Diekman, Derrick Loop, Mike McGuire and Jake Borup, went out to a local Florida establishment to view the Phillies playoff opener against the Reds, on television. Phillies pitcher Roy Halladay went on to make history in game 1 of the National League Division Series. 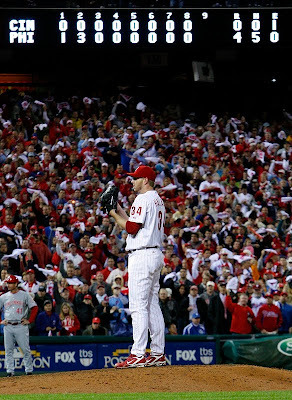 Making his very first career postseason appearance, Halladay shut down the Cincinnati Reds, hurling a no-hit, no-run game. It was just the second no-hitter in MLB postseason history. Halladay's command was tremendous as he threw first-pitch strikes to 25 of the 28 batters he faced. Much like Phillies phans throughout the Philadelphia region, even the Phillies' prospects are confident in their parent club's abilities. Especially, those of the ace hurler, Halladay. "When the Phillies got their first run, we all looked at each other and said, 'That's ball game! Game's over! '," Hernandez stated, inferring that he and his prospect peers knew Halladay wouldn't allow the Reds to post anything except zeroes on the scoreboard that night. In a location full of disappointed Tampa Bay Rays fans, the group of Phillies endorsers stood out a bit, while Halladay was attempting to re-write some chapters in baseball history books. "We were high-fiving in there. We were chest bumping. We started hitting our tables anytime he got two strikes," the 12th round 2009 draft pick Hernandez told PhoulBallz.com in an exclusive interview. "As the game went on, we didn't do anything to jinx him, so we all kept our mouths shut, but we all knew what was going on." The excitement level carried over to the ballpark Thursday morning. Pitchers met for an 8:15 meeting, and naturally the first subject everyone spoke of was Roy Halladay. The Phillies instructional group played split squad games later in the day, sending a team to Dunedin to face the Toronto instructional team. Shortly after many guys jokingly asked one another, "Who can be like Doc today? ", the Phils pitchers held the Blue Jays without a baserunner over 9 innings, after a hit led off the game. "He inspired us. It really did. He hits his spots, he commands well, he carries himself on the mound a lot better than some other guys do, he's very professional, he works hard, he does all the little things right that a pitcher needs to do," Hernandez said. "We learn from (watching) him. He does things on the mound that not too many guys can do." Halladay spoke with Phillies minor leaguers in spring training. Many of those players took something out of their limited time with the man often regarded as the best in the business. But, while a brief speech and some questions & answers are memorable, nothing can galvanize quite like a momentous effort that people will be talking about for generations. "It's something special. Something I know (we'll) never forget," Hernandez stated.